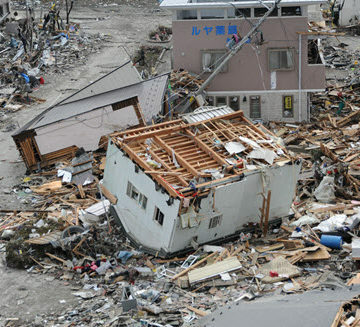 The 2011 Tōhoku earthquake and tsunami provided crucial reconnaissance information for the ASCE 7-16 tsunami provisions. 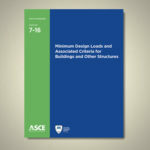 The forthcoming standard ASCE 7-16, Minimum Design Loads and Associated Criteria for Buildings and Other Structures includes an entirely new chapter devoted to tsunami design provisions. That’s a simple statement of simple fact. But the process to make it a reality was anything but simple. Gary Chock devoted the better part of a decade to researching and building the provisions. When the Tōhoku earthquake and tsunami struck Japan in March 2011, Chock and his ASCE 7 tsunami subcommittee team flew to the front line to gather data. Chock literally crawled through overturned buildings among the tsunami rubble to document every possible piece of reconnaissance information that might contribute to the new design provisions – a project to protect an estimated $250 billion of economic assets and critical infrastructure at risk in the United States coastal zones. “A major tsunami would become a multi-state disaster of national importance,” Chock said. ASCE 7-16, including those tsunami provisions, goes to a vote this month by International Code Council governmental members to determine if it is adopted as a reference standard in the 2018 International Building Code. 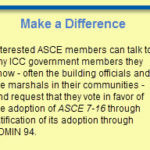 ASCE is calling on members to contact ICC governmental members – typically building officials or fire marshals – to urge their support for ASCE 7-16. Chock, S.E., D.CE, F.SEI, Dist.M.ASCE, chair of the ASCE 7 Tsunami Loads and Effects Subcommittee, recently talked with ASCE News about how the tsunami design provisions came to be and why they are so important. ASCE News: When did you start working on these provisions? Chock: I was involved with colleagues at the University of Hawaii in some research that was funded by the National Science Foundation that did some very good work in terms of determining structural loads due to hydrodynamic forces of tsunamis. At the end of that project – and this was in 2009 – we thought that we had the elements in place that could be put together to create the basis for tsunami design provisions. So it was about 2009, 2010 when we worked toward creating sort of a master plan of what this could become. And during that time, of course, there were events in Samoa and Chile that we also went to look at – tsunami damage in structures that failed and those that survived – that were supportive of what we were finding out in the research. We approached ASCE to request that they create a tsunami subcommittee of ASCE 7. We were authorized to begin our work as a subcommittee in February 2011, almost literally one month before the March 11th Tōhoku event. ASCE News: Which became a big part of your research, right? Chock: I organized members of our subcommittee to be the first American team into Japan after the tsunami. As it turned out, we were the first team from outside Japan on the ground. We had the objective of doing more than what would normally be done in reconnaissance, because we were trying to explicitly find structures that we could use as case studies for validating the tsunami provisions. We needed to find structures that had some level of failure because the tsunami had mobilized the full strength available for that structure or that structural element. When we found those cases, we took very detailed information in terms of dimensions of the structure. In the failed element, we’d take samples of concrete and rebar – literally cut them from the structure to take them back to the States to do testing. We took detailed measurements of steel structures as well. And in some of these structures that failed – the ones where we were wondering, “Okay, how could this building be uplifted or overturned?” – literally we were taking this type of information with the building on its side. So you can imagine crawling into a structure that’s on the ground and having the floors and ceilings be at 90 degrees, and taking that information very methodically so we could have sufficient information to do detailed analysis. Then after that we sent a follow-up team that had LIDAR capability, which is three-dimensional scanning. They would go back to certain structures that we designated and others that they thought were useful to do a LIDAR scan. So essentially you have a three-dimensional model of that building, inside and out, where the accuracy of the deformations that you can measure are very good. With that data, we could later do an analysis of tsunami loading in accordance with our provisions to determine whether they were accurate or not. And moreover, what we were able to do as we finalized those provisions to have the correct level of reliability, we were able to ask, “Okay, for that structure that failed, if we had designed it in accordance with ASCE 7-16, would we have prevented the failure?” And what we found was we could verify that in fact those case-study failures would have been prevented if ASCE 7-16 tsunami provisions had been utilized. So that was very persuasive to us, that we were able to fully utilize that [Tōhoku] experience as a means to validate the tsunami chapter for practical applications. ASCE News: How do you see these provisions helping? Chock: It’s a relatively narrow but extremely important geographic area of application for the five western states. And, of course in Hawaii the tsunami inundation extends into the major population centers along the coastlines of all the islands. But there are a lot of people at direct risk in those areas, over 2 million including transient populations. And if you think about the national economy, there is a great dependence on trade and commerce from our coastal harbors and ports, just as one example of critical facilities in the coastal zone. There is over $250 billion of economic assets and critical infrastructure at risk. A major tsunami would become a multi-state disaster of national importance. So, really, this is working toward resilience of the coastal zone and that is a very important endeavor for the nation. Thank you for sharing Mr. Walpole.